Sail away by Island ferry to Rousay where the seas brought many cultures to its shores, leaving a remarkable array of ancient remains for us to wonder over. Rousay is steeped in archaeological history from the Stone Age, the Pictish Iron Age, the Viking Invaders, the period of the Earls and the troubled crofting times. For this tour, good walking footwear is advised as well as waterproof clothing. At 9am we take a short drive to Cuween Hill Chambered cairn. 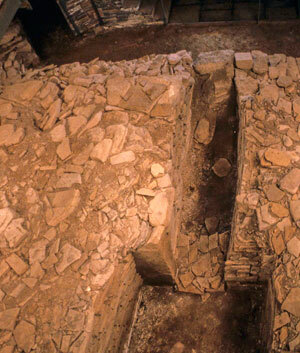 Dating from around 3000BC excavations in 1901 discovered the remains of at least eight people. Also found were 24 dog skulls perhaps suggesting totemic culture. Then we depart for Tingwall in Evie to board the ferry to Rousay and enjoy en route quite spectacular views of the Islands of Eynhallow and Rousay from Burger Hill view point. 10.15am Arrive at Tingwall boarding point. (Toilet facilities are available.) Depart Tingwall for Rousay. Enjoy the sea views, the crisp clean sea air and the chance to see common seals and birds native to these islands. Arrive at Rousay 11am. Our first visit will be the Trumland Visitor Centre. There you can source detailed information and interpretation of many ancient sites as well as natural history, modern and historical. The first places of significant interest are Taversoe Tuic, Blackhammer and the Knowe of Yarso burial Cairns. Dating from around 3000BC various remains were found inside the cairns including human and red deer also found were flint and stone tools. 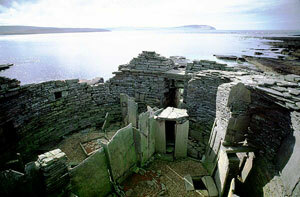 Now we move on to visit, what most people think to be the spectacular highspot of the trip, the Midhowe Broch. It is amongst the finest examples of a fortified dwelling built during the Bronze/Iron Ages. A short walk from Midhowe Broch lies Midhowe Cairn. 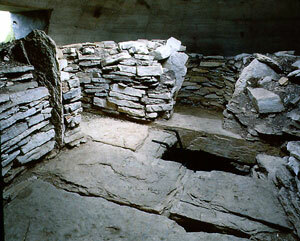 The stone age cairn dates from around 3500BC and is one of the largest of its kind at 23 meters long it is an impressive site.The remains of 25 individual were found. After a leisurely lunch we will continue our trip to Wasbister Loch, the site of two crannogs or Iron Age fortified settlements built on artificial islands. As we continue we pass Saviskaill Beach a sheltered sandy beach which is a common place for the local seal population to live. Tour fees include all admission fees, ferry fees and lunch. Its all in this tour; broch's loch's cairn's and culture's. By ferry to the island of Rousay - what riches in store for you! We also operate a taxi service for routine travel all over Orkney Mainland, Ferry Transfers and Airport Transfers. This tour has been organised so that guests of our visiting cruise ships may enjoy the wonderful sights Orkney has to offer. Our tour starts at 8am where you will be collected from your ship and returned there after the tour approximately 3pm. For your convenience we can now accept payment by most major credit/debit cards. Enjoy any of our tours in an all inclusive family price of between £198 - £220. 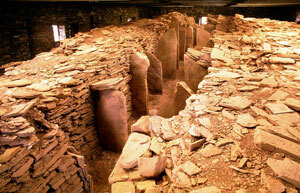 Visit the newly excavated Banks Tomb with Explore Orkney - see Fascinating Tombs page for more details. Our company is a family business, we have been born and brought up in the islands and have a 1000 years of ancestry. Help us to sustain our unique culture by supporting Genuine Orcadian Enterprises.